These candleholders actually date from Fenton's early 1930s production. Five and one-half inches tall. 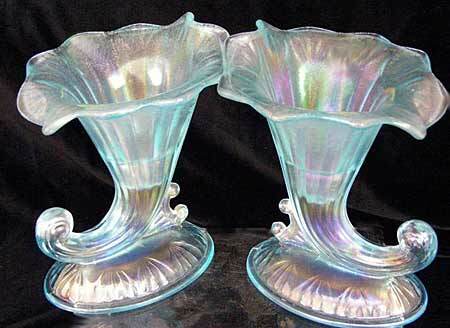 Non-iridized examples were produced later in the 1930's in amber, royal blue, Ming Rose (pink) silvertone and probably other colors. The 950 line also included a bowl, sometimes found with these candleholders.